Tan Tar A large, three-bedroom, three-and-one-half bath home with lake view and hot tub. Sleeps 4-12. Located close to outdoor pool. Parking for three vehicles. There is a fully-equipped kitchen, both gas and charcoal grills, and a screened-in porch and open decks. Besides the bedrooms, the living room also has a large TV with a VCR/DVD player with high-speed internet. There are flat screen TV's in all 3 bedrooms. The house is a non-smoking home. I am a retired college accounting instructor and women's basketball coach. If rentals are for more than one week, linens and towels will be changed. In living room and all bedrooms. Fully stocked with cooking utensils and plates, silverware, etc. Living room & suite bedroom have TV with VCR/DVD player. Other bedrooms have TV w/DVD player. Screened-in porch with dining table, also adjacent hot tub. Lower level has balcony also. Wonderful place to stay, close to attractions, lake and golf. House was in great order with everything you could possibly need for a trip. We were on an 8 man golfing trip and had plenty of room and accommodations. Highly recommend! Great location and the house was large!!! The house was easy to find, the location is ideal for families with kids being so close to the resort. The rooms all have attach bathrooms and large closets. Full kitchen with pots and pans for home cooked meals. Not a great lake view with all the trees in full bloom but very easy to walk down to the lake. Large screened in porch with grill and very nice hot tub off the master. Thank you Bill!! Thank you Amanda. Glad you enjoyed your stay at our house. If you come to the lake again you are always welcome. Wife and I had a romantic getaway that ended with us not wanting to leave. Thank you for the great review. Glad you had such an outstanding romantic getaway. Well worth the price. Beautiful home everything you would need. So quiet and very pet friendly. Definitely would rent again. Thank you Amy. Glad you had a great time. This was much better than expected. The rooms are all Suites which is very nice. Very cozy. Not the best view of the lake but that's okay. Totally worth it for the price. Thank you for the review. Glad you enjoyed your time at our house. 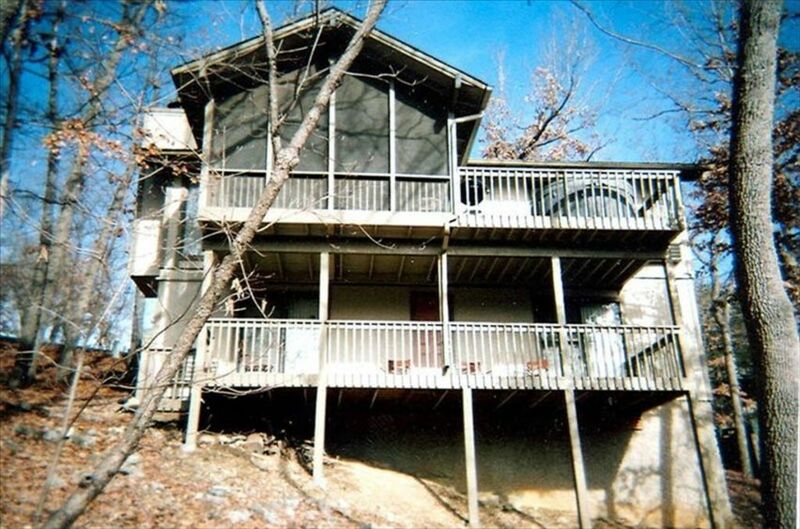 Our house is in Tan Tar A Estates, a beautifully wooded section of the Lake of the Ozarks. Boat slip is available May 1 thru October 31. There are many activites in the area, including boating on the lake, numerous resort type golf courses, childrens activities (swimming, indoor & outdoor water parks, go-carts, game rooms, etc), horseback riding, an enormous outlet shopping mall and many fine dining facilities. Golf: Tan-Tar-A has 2 golf courses and there are many other outstanding courses in this golf mecca. In the spring and fall the use of more than the one bedroom will be charged as follows: Spring & Fall $25 per room per night and Winter $20 per room per night. Thanksgiving, Christmas and New Years will be charged at the Spring/Fall rate. In Spring, Fall and Winter a two night rental will be charged a cleaning fee, $50 for the suite and $25 for each additional bedroom.